The Order of Preachers celebrates its 800th Jubilee this year. Before our founder St Dominic received papal confirmation of the Order, though, he had lived in Osma as a canon regular under the Rule of St Augustine. Indeed, Pope Honorius III had confirmed the Order of Preachers likewise as a group of canons regular. Like our founder we Dominicans still profess obedience to the Rule of St Augustine, and like other canons (both secular and regular) we wear a kind of mozzetta with a hood as part of our habit – we call this part a 'capuce'. However, to distinguish ourselves from canons, our founding stories tell of how Our Lady gave Blessed Reginald of Orleans (one of the first Dominicans) a monastic scapular that henceforth replaced the canon's rochet. In this Jubilee Year, our Dominican heritage as canons regular living under the Rule of St Augustine was especially brought to my remembrance recently when I had the chance to spend the Memorial Day weekend with the Canons Regular of the New Jerusalem (CRNJ). The CRNJ are a relatively recent American foundation who, after some years of a somewhat peripatetic existence, have finally settled down in the Diocese of Wheeling-Charleston, thanks to the hospitality and wisdom of Bishop Michael J. Bransfield who agreed to give the CRNJ canonical recognition, and who duly incardinated their clerics into his diocese. Hence, in October last year, two canons regular were ordained in Charles Town, WV by Bishop Athanasius Schneider; it was a most beautiful and joyous occasion. Since that occasion, I have been keen to find out more about the CRNJ and their life but it wasn't until last weekend, with the academic year over, that I had the chance to visit the community. The Canons Regular of the New Jerusalem have their Priory, dedicated to Our Lady of the Annunciation, in Charles Town, WV. The dedication recalls the Augustinian canons' foundation at Walsingham, the ancient Shrine to Our Lady in England; the CRNJ are founded to make reparation for the destruction of that Shrine and for the abandonment of the Catholic Faith by the canons regular during the Protestant Reformation. Located just a block from the heart of historic Charles Town which was founded in 1786 by Charles Washington (brother of the first U.S. President), the canons have the care of a small church which belongs to the Diocese but which is given to them as their permanent oratory. It is a charming rural church which the CRNJ have transformed into a sanctuary of worship and prayer, reminiscent of the medieval Shrine of Walsingham in its intimacy and candle-lit beauty; votive candles burn constantly before the image of Our Lady of Walsingham at the Lady Altar. 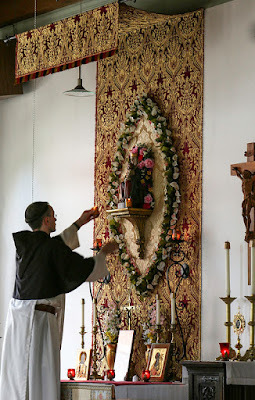 As an English Dominican, I was glad to be able to celebrate private Low Masses in the Dominican rite at this Altar. The Liturgy here at the CRNJ is celebrated in its entirety according to the Extraordinary Form, both the Mass and the Divine Office, and the other sacraments. Often the liturgical form can be separated from the rest of one's religious life. So, for example, if one occasionally celebrates the Mass according to the 1962 Missal, the Mass in this form is somewhat marooned from the rest of the former Liturgy and also from a religious life that gave it its context. This is not the case for the CRNJ, and I found this deeply attractive. For the old Mass in Latin flowed organically from the Latin Divine Office, as well as from the other sacraments such as Confession, for example. Thus I had the chance to hear Confessions in the older form in Latin on Sunday before the High Mass, and one sees at once the connection between the prayers and formulas used in Confession, and again at the beginning of the Mass. Moreover, as I stood in choir and prayed the psalms of Matins in Latin, I felt a connection to St Dominic, who would have done likewise with his fellow canons regular in Osma. And as I looked at the tonsures on the heads of these canons today I recalled that St Dominic and the other Dominican saints are often shown with tonsures, as had been our practice too until recently. This Liturgy and way of life has, in our time, become extraordinary. And yet, what made my experience of the CRNJ life so beautiful was the ordinariness of it all. With the Canons Regular of the New Jerusalem, I glimpsed what it was like for 21st-century religious to pray in Latin ordinarily, to sing the old Mass ordinarily, and to work and live in the habit ordinarily. And because it was ordinary the Liturgy also seemed relaxed without becoming casual, organic and lovely rather than an oddity or showpiece as can be the case elsewhere when the Extraordinary Form is something out-of-the- ordinary for which clergy and singers have to be imported for an 'event'. The result of the canons' commitment to this life and Liturgy is the creation of a culture. This is to be expected since the 'cultus' of the Liturgy has always enriched the surrounding culture and imbued it with beauty; the Faith and its liturgical expressions gave rise to a civilisation. Hence, the canons have attracted a goodly congregation to their oratory who, together with them, form a civilisation of love and beauty. As a result, a talented group of young Catholic musicians come here regularly, and they sang Byrd's Propers for Corpus Christi at the Sunday Mass, which on this weekend was kept as an 'external solemnity' of Corpus Christi; I preached this Homily at the Mass. The Gregorian chant Ordinary for the Mass was sung by the whole congregation, and a Schola sang Gregorian chant hymns and antiphons during the Eucharistic Procession, while the congregational hymns during these devotions were sung by all in four-part harmony. Present at the Mass were many young families with plenty of lively children who were actively involved in the celebrations. 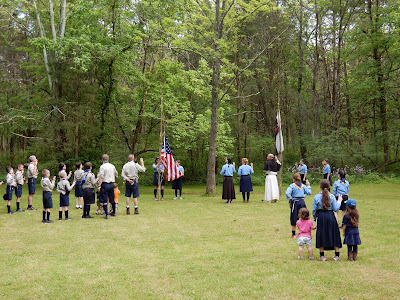 Indeed, many of the children helped with the Eucharistic Procession, and did so in the uniform of the Federation of North American Explorers (FNE). A word about the FNE: they are the American branch of the International Union of Guides and Scouts of Europe, which is a Vatican-approved private lay association of Pontifical right. 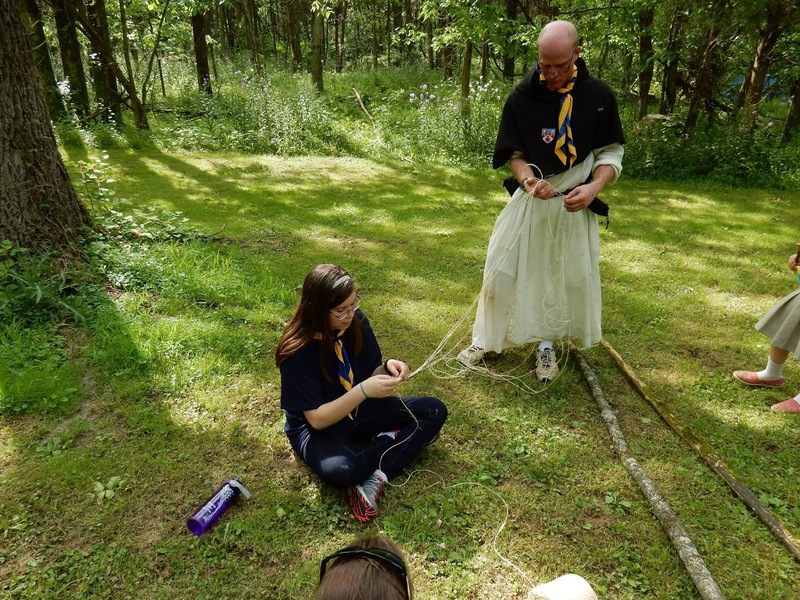 This group, which has a distinctive French influence, believes that through traditional Scouting (or 'Scoutisme') according to the insights of both Baden-Powell and the Venerable Fr Jacques Sevin SJ, Catholic children are formed in virtue and in the Faith. In Europe, 'Scoutisme' is hugely successful and many will have seen French Catholic Scouts assisting at the annual Chartres Pilgrimage; Scoutisme accounts for many religious and priestly vocations in a scale that is disproportionate to the numbers involved. In North America, the Scouts of Europe go by the name of North American Explorers and, having begun in Canada, they are currently expanding rapidly in the USA. If any Catholic parent and pastor is looking for a vibrant Faith-based alternative to the mainstream Scouting and Guiding movements, do investigate the FNE which has a proven track-record. This year the movement in Europe celebrates its 60th anniversary. The FNE group attached to the CRNJ in Charles Town, WV is one of the first groups in the USA, and the canons are instrumental in its development. In addition to the above, the canons are currently in the process of opening a coffee shop, just a block away on the main street of Charles Town. It will be called 'Mad Monks Coffee Shop', and it will be staffed by friends of the community although the canons will also be on hand when their schedule allows, and they will provide some of the baked goods for this shop. It seems to me that this is a development with good apostolic promise; a chance to witness to the joy of the Gospel. Finally, I had a chance to visit a house near the Priory which serves as an art studio. Here, the Prior, Dom Daniel Augustine, makes impressively beautiful hand-crafted vestments with the help of long-standing friends of the community. Dom Daniel Augustine is currently making a High Mass set for an ordinand of the diocese, and he is open to receiving orders for new vestments. What I discovered this past weekend, then, was a thriving and inspiring community gathered around the Canons Regular of the New Jerusalem, who are committed to the Church's living Tradition – not as a showpiece nor because of 'nostalgia' nor with any combative sense, as such, but because this Tradition sustained the Faith of many, and formed countless souls in holiness. One such person, indeed, became the sainted founder of the Order of Preachers. Currently the CRNJ numbers three: Dom Daniel Augustine, Dom John Berchmans, and Dom Alban. However, if so much can be accomplished by three, imagine what more could be done if their number were to double. So, I would encourage young men who are thinking of a religious vocation, and who are committed to the traditional Liturgy, to consider the Canons Regular of the New Jerusalem; do go and visit them. At the very least, you'd have a good retreat and some soul-refreshing days of beautiful worship and prayer – I know I did! Some of the photos in this post are used courtesy of Mr Joe Kline, and of the Priest Field Pastoral Center.